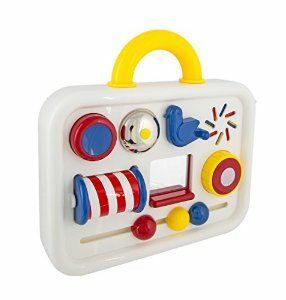 What a wonderful gift - perfect for keeping your baby entertained wherever you are! Fascinating activity centre with 6 activities for little hands to explore. Press the button and it squeaks. Pull back the blue bird to chime the bell. Slide the mirror to see who’s hiding underneath. Encourages manual dexterity and learning about cause and effect.